Samsung’s latest flagship smartphones, the Galaxy S9 and S9 Plus, are scheduled to go on sale next week on March 16. 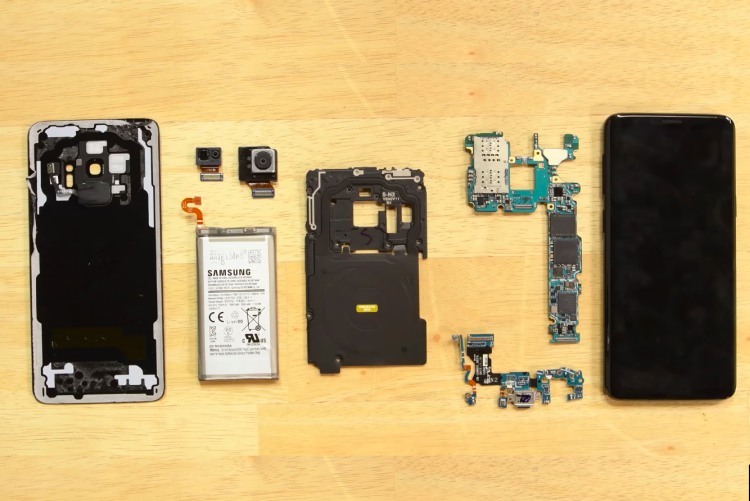 Well-known repair company iFixit has already gotten its hands on the Galaxy S9 to do the thing they do best – open the device and pull everything apart to see how easy it is to repair the devices. Now that it has been given the iFixit treatment, It’s clear that much like its predecessor, the Galaxy S9 will be quite difficult to repair. It has scored a measly 4 out of 10 as repairability score, to signify that it will be complex to fix the phones at home or as a DIY project. iFixit’s in-depth document reveals that the teardown went smoothly and not a whole lot of surprises were found during the process. It is relatively simple to pry off the back glass cover, just like with the Galaxy S8, to reach within and separate all the internals. It has been revealed that there are several modular components, like the 3.5mm audio jack, fingerprint sensor or the front camera, which can be replaced in a jiffy. However, that’s the extent of the easy of repairability and the low score can be attributed to the following problems. The Galaxy S9 disassembly requires you to battle with some strong adhesives to remove not just the back cover, but also the battery if you’re looking to replace it. It is an unnecessary challenge that could’ve been avoided simply by adding a pull tab. The front and back panels are both made out of glass, so it doubles the crackability coefficient of the Galaxy S9 lineup. As for the optics department, which is a notable change in this iterative device, iFixit has found that the dual aperture lens is using just 2 rotating, ring-like blades for the single adjustment – jumping between the two modes instead of the conventional 5 blades that are demanded for this task. There’s nothing special on the front as the facial recognition has been implemented using the existing iris scanner and front camera. They have even implemented ARemoji using this combination. So, while the teardown and repair rating may be on the lower side but Galaxy S9 and S9 Plus are top-tier hardware-wise.